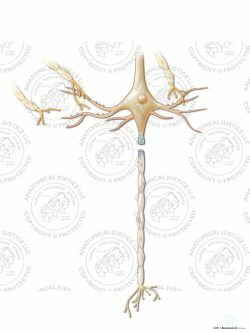 This animation, fourth in a set of four, depicts neural anatomy of the brain and the mechanism of axon shearing. 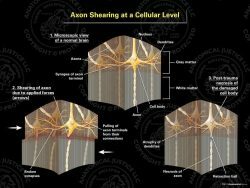 Axon shearing occurs when the heavier neurons move faster than the lighter axons during a hyperextension hyperflexion injury. 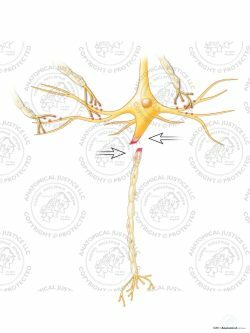 This causes the axon to shear away from the neuron, resulting in necrosis of the cell. 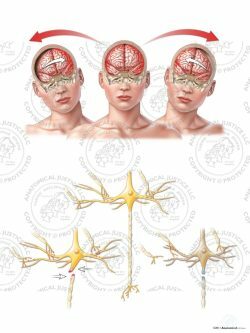 Neural signal transmission is inhibited due to the damage.